Shopping for new shoes can often be difficult and tiring and may even leave you feeling very frustrated. 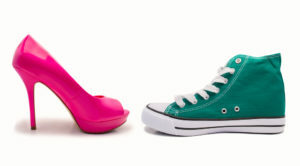 How do you know which shoes are right for you? Where do you look? How do you know if they fit correctly? These are just some of the many challenges associated with finding the right pair of shoes. Our podiatrists at Feetology have listed a few helpful tips below to ensure you walk out with the right pair of shoes! It is important we choose shoes designed for the activity we intend to use them for. It sounds simple but this is vital for efficient function and to reduce the possibility of injury. For example, if you do a lot of walking it is important to purchase a walking shoe, if you play a court based sport (eg. Netball) look for a cross trainer or if football is your main sport, make sure you wear football boots. The heel collar of the shoe (material at the back of the shoe around the heel) should be firm but padded to provide comfort and reduce irritation/blisters. There shouldn’t be a gap between your foot and this part of the shoe when you have the shoe on. Having a small heel/lift at the back of the shoe can be beneficial but look for something relatively low and stable – less than 5cm in height and a wedge or Cuban style heel is better than a stiletto as they are more stable. When trying on shoes, you shouldn’t be able to feel your toe(s) hitting the end of the shoe. For enclosed shoes, aim for a thumbs width room from the end of your longest toe to avoid getting bruised toenails. For sandals, your toes should be sitting on the base of the shoe with no overhang. Tip: Fit the shoe to your longest toe – this may not be your big toe! Width is an important consideration that gets overlooked too often! It is important that you don’t go up multiple sizes in the length of the shoe to try and get more width. If you have a broad foot or any digital deformities (eg. Bunions, claw toes etc) look for shoes that are wider, particularly around the toes – a good tip here is to look for shoes with a square/rounded toe box instead of a pointed/tapered shape. There are also some brands that cater more for wider feet – e.g. New Balance (sports shoes). If you have orthotics/inserts always take them with you when looking for new shoes. Looking for shoes with removable liners and adjustable fastenings is a good place to start. Try your orthotics in the shoes to ensure they fit well and you still have enough space for your feet. You may require a half size larger to allow for a better fit. This entry was posted in Blog Posts on November 11, 2018 by Feetology.